By Jason Kim: Robert Guerrero (29-1-1, 18 KO’s) is the favorite going into his fight against WBA light welterweight interim champion Marcos Maidana (30-2, 27 KO’s) on August 27th at the HP Pavilion, in San Jose, California. The WBA regular title, the one previously belonging to Amir Khan, will be up for grabs in this fight with Khan being elevated to “Super World” champion by the WBA. Guerrero is faster and the much better skilled technician of the two. He can also punch pretty well, and I would say he’s considerable step up for Maidana from his last opponent Erik Morales. Honestly, things don’t look good for Maidana in this fight, because Guerrero is so good at many different areas that Maidana could find it hard to be competitive. However, Guerrero isn’t without his flaws. In his bout with Orlando Salido, Guerrero had difficulties when Salido was throwing double and triple hooks to the body and head. That was a real problem for Guerrero in that fight, as Salido walked through Guerrero’s shots again and again and punished with harder hooks in close. In the end, Guerrero was beaten by a lopsided 12 round decision, but lucked out when Salido tested positive for a banned substance after the fight. I don’t think that’s why Salido was able to handle Guerrero so easily, though. It was his hooks, power and ability to walk through Guerrero’s shots that won the fight for Salido. Maidana unfortunately doesn’t really throw a lot of multiple hooks. He can throw hooks, but he doesn’t double up on them the way that guys Salido, Juan Manuel Marquez and Humberto Soto do. These are all tough Mexican fighters that know how to throw hooks on the inside and are very difficult to beat. Maidana needs to add those guys of punches to his arsenal and quick if he wants to beat Guerrero on August 27th, because he’s not going to beat him by throwing one punch at a time the way he fought Amir Khan. Maidana has to throw more combinations and the way to do this is to rewind when throw a left hand or a right and work Guerrero over in close. 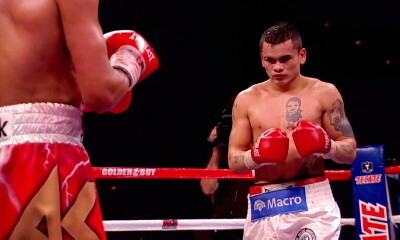 Maidana is a good inside fighter, but oddly enough he doesn’t throw a lot of multiple hooks. He’s going to need to in order to beat Guerrero. « Did Haye con fans in his fight against Wladimir?